Derry have named two changes to their starting line-up for this Sunday’s Division Two clash against Meath in Navan (throw-in 3pm). Meath will be looking at Sunday’s game as a ‘must win’ fixture and we are approaching the game in the exactly the same manner. With a knee injury ruling Mark Lynch out for up to six weeks, Glen forward Danny Tallon gets a chance to impress while Ben McKinless comes in at No. 1 at the expense of Thomas Mallon. Otherwise it is as you were for Damian Barton’s team against a Meath side comprehensively beaten by 10-points at home against Kildare last week. 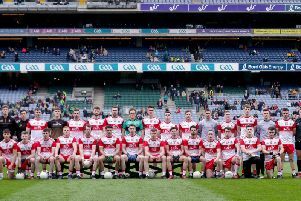 That defeat, coupled with Derry’s failure to pick up two points against Clare last Sunday, has added extra importance to Sunday with Oak Leaf assistant manager Brian McGuckin describing the game as ‘must win’ for both sides. “I have to admit I was shocked when I heard the Meath result last week and it puts an awful lot more importance on this week’s game because we are sitting on one point and Meath have no points,” explained McGuckin. “The fact that it is in Navan as well is significant as there is a lot of history and tradition between Derry and Meath. They will be looking at Sunday’s game as a ‘must win’ fixture and we are approaching the game in the exactly the same manner. McGuckin said after reflecting on last week’s performance, he viewed the 0-11 to 1-08 draw with Clare as a point dropped and stressed the importance of going into the two week break with a win. “As the week has gone on and after watching videos of the game and analysing it in a bit more depth, last week was very much a point lost. We created so many opportunities but made wrong decisions here and there. I think had we scored one of the earlier goal chances we would have gone on to win the game but again, Clare are a good side. “They proved their calibre last year and when they kicked their final point last week it very much looked like they would be leaving with two points so from that perspective, we showed a lot of character. “We got the ball to the right man because there is no better man than James to kick that kind of point. The Derry assistant said the squad had worked on decision-making this week after passing up a number of goal opportunities last Sunday in Celtic Park. “On a couple of times, the ball could have been tapped over the bar and a point would have been more than useful but, then again, one final pass and a man is standing free and kicking the ball into an empty net. “That’s about showing the composure that’s required and making sure you are making the right decision or get the right man on the ball in the right position. “We have worked on that this week and the players are all aware of the situation,” he added.